Happy Halloween just a few days late to all those who celebrate it. It really isn't very big in Australia, but you seem to see more and more items in shops every year. This year, I joined a group of lovely ladies over at Create on Garden for an 8 hour Halloween Scap-a-thon. It was great to be in a room full of creativity and really had the creative energy giving me inspiration. 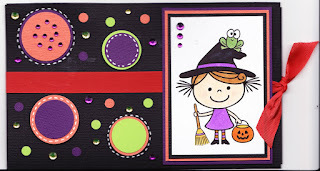 So of course I had to do a Halloween card, and as I haven't got any Halloween stamps, I went on a search for a digital image, and found the perfect one available from Pink Cat Studio Digi Stamps. This Itty Bitty Betty image is gorgeous, and so easy to download and print and only $3.00! I decided to do a slider card, that was featured ages ago over at Hero Arts, and used a Hero Arts Alphabet set to do the message inside.